It’s pretty rare to find devices out there that are compatible with both iOS and Android devices, but we found one that you’re going to love. If you’re platform agnostic and you use multiple devices that run different operating systems, or if you live in a household where some people use Android and others use iPhones and iPads, then the ONCHOICE WiFi Display Dongle is a must-have. 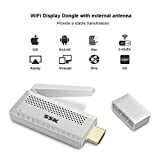 It supports DLNA and Miracast so it works with Android devices and laptops, but it also supports AirPlay so you can stream Full HD video from your iPhone or iPad. At just $33, it really is a steal.